Would you believe these shoes are still runnable? Other than the tread damage noted below and the uppers looking a bit worn, they still feel basically like new. It’s going to be hard to keep up with new versions of the LonePeak if I manage to keep a pair of shoes around for several years like this. While I still like the Altra Lone Peak 2.0′s, I’m not as happy with them as I was when I wrote this review. 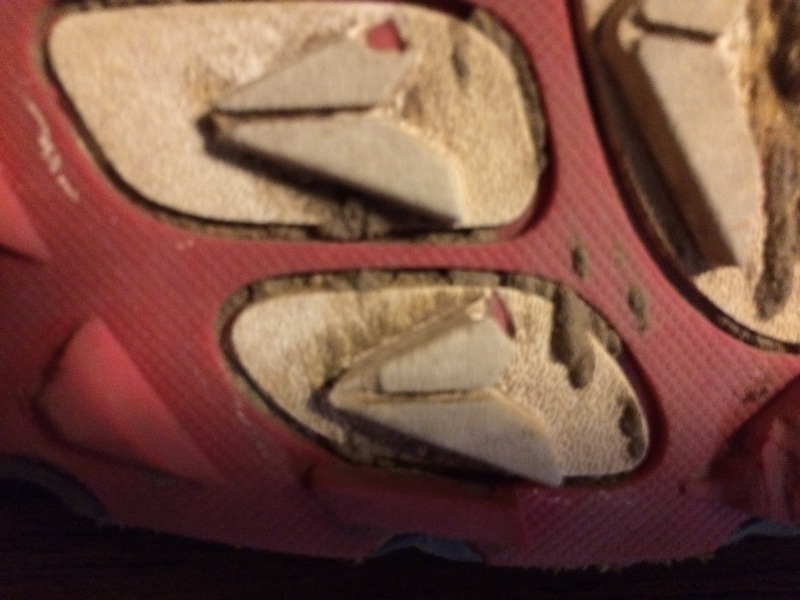 I doubt I have more than 40 miles on these shoes, and the tread is breaking away. My Cascadia’s look almost new at well over double the mileage. The tread damage in and of itself could have been a fluke, but it also led me to choose the Cascadia’s over the Lone Peak’s for Sunday’s trail race due to the conditions. The trails were covered in snow and ice, and at the last minute, I decided to use screws for traction. I didn’t see any good locations in the perimeter of the Lone Peak’s to hold the screws. The already crumbling tread also had me wondering if the screws would ruin any part of the tread I put them into. The Cascadia’s, on the other hand, had some perfectly sized tread at the perimeter, and the screws held nicely without damaging the tread. The final issue might be a figment of my imagination. I’m slower and wearing out faster in the Altra’s. When deciding which shoes to use with screws, I noticed for the first time just how soft the Altra’s land vs. the Cascadia’s. I don’t have the speed or fitness to spare to lose energy to a softer landing. That softer landing might also be undermining proprioceptive feedback when my foot contacts rocks and roots. 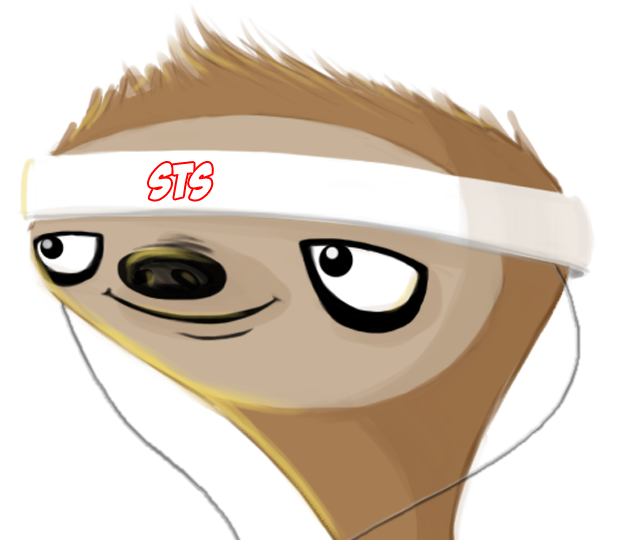 Again, though, the merit (or lack thereof) of soft cushioning is all conjecture on my part. The only quantitative evidence I can provide is my 9:12 pace in Sunday’s race vs. my 9:45 or slower average in most of my training runs, all of which were run under much better conditions (i.e. dry vs. snow/ice). Then again, it was a race. Adrenaline can do strange things. So, what do I think of my Altra’s now? I honestly don’t know. I was seriously considering their road shoes for an upcoming marathon, but I might end up sticking with the Brooks Pure line. Regardless, I think we can safely mark me off the list of maximalist shoe proponents. Sorry Hoka. During 2014, I did most of my trail running in the Brooks’ Cascadia 9. I run primarily on technical trails with steep grades, and it’s important for shoes to both protect my feet from the terrain and provide a stable platform with good grip. The Cascadia did both while at the same time providing an upper that fit my feet so comfortably that I rarely have to retie my shoes. That may sound odd, but if you had ever seen me at the beginning of a race obsessively tying and retying my shoes, you would know what I mean. 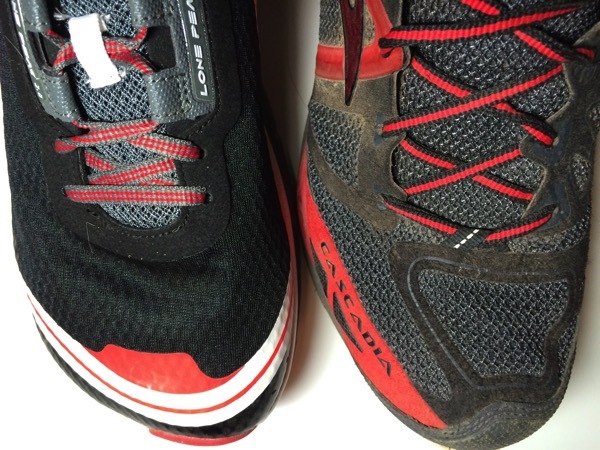 The Cascadia was my first real trail shoe, and judging by the opinions of other bloggers, it’s the benchmark by which many trail runners judge shoes. To say the Altra Lone Peak 2.0 had a lot to live up to would be an understatement. With a couple of runs now under my belt, I’m happy to report the Altra did that and more. My first reaction upon tearing open the gift and opening the box was that I had received the wrong size. They looked huge. I had trouble taking a picture from an angle that would do the size difference justice, but if you’ve ever seen a 2E or larger shoe, that’s what I initially thought I was seeing. Nevertheless, the shoes fit perfectly and seem true to size. Altra shoes are known for their natural toe box size and shape, and that’s the major reason I decided to give them a try. With years of wearing J-toe cowboy boots having shoved my toes together, I blister easily and sometimes end up with cuts from toenails from one toe impacting another toe. To counter my messed up toes, I wear toe socks. With a single layer, toe socks do not normally cause a width problem, but if it’s cold or I’m running over 10 miles, I will wear toe socks over toe compression socks. Even in the generously sized Cascadia’s, it can be tight and uncomfortable. On today’s Lone Peak 2.0 test run in 30 degree weather, I wore both layers, and my feet were unquestionably more comfortable than they’ve ever been. My toes could spread out naturally, and I experienced no numbing sensation in my little toe like I have with other shoes. The other selling point of Altra shoes is zero drop. The Cascadia is the only shoe I’ve worn with a traditional heel-to-toe drop since changing to a mid-foot strike. I usually race and train in Newton’s or Brooks’ Pure Cadence in the 0-4mm drop range. While I can accommodate the 12mm drop of the Cascadia in my trail gait, I felt like I was running with a more natural, comfortable gait in the Lone Peak 2.0. That said, if you’re a heel striker, the Altra may not be your shoe. Traction in the Lone Peak 2.0 rivals that of the Cascadia. In 4 miles on Turkey Mountain today, I don’t recall slipping once, and in those 4 miles, I covered the steepest, most technical ascent and descents Tulsa’s trails have to offer. You can see the tread pattern below. It reminds me a bit of Newton’s with the 5 triangular treads under the metatarsals. The Lone Peak 2.0 also have a few millimeters of extra rubber sticking out behind the shoe’s normal sole. I think they call this the Trail Rudder, and I managed to trip myself on it a few times when I put them on. Given the incredible grip these shoes provided, though, I’ll just assume Altra knows what they’re doing and continue to appreciate this little oddity. The shoes also have a little velcro trap for gaiters, but I must be a wimp because I’ve never run in conditions where I needed gaiters and don’t own any. A lot of zero drop runners are likely minimalist shoe lovers. Minimalist the Lone Peak 2.0 are not. At 10.9 oz they come in just mere fractions of an ounce lighter than the 11.7 oz Cascadia 9’s. The first time I wore them, I honestly thought they were much heavier, but in retrospect, I hadn’t worn anything but Pure Cadence in quite some time so I likely would have had the same reaction to the Cascadia’s weight. It would be interesting to compare the Superior 2.0 weighing in at 8.7 oz, but unfortunately I can’t buy all the shoes. Summing up, I’m pleased with the Altra Lone Peak 2.0’s, and given some of the challenges I had this year with my favorite road shows, the Pure Cadence, I may have to give Altra’s road shoes a look for my upcoming marathon. 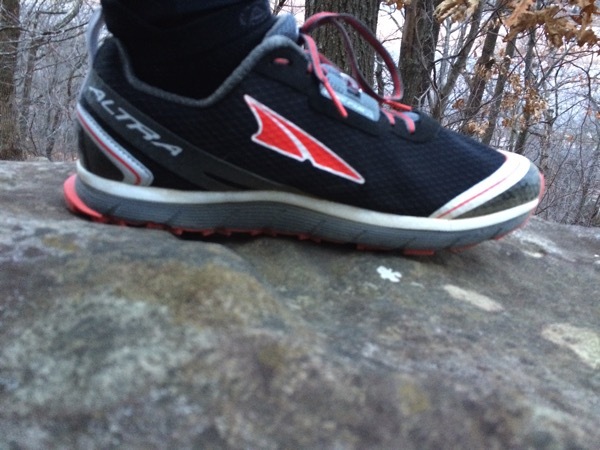 Altra and the Lone Peak 2.0 definitely get the 3-Toed Seal of Approval. As I put more miles onto The Altra Lone Peak 2.0’s, I’ll try to post an update if I discover anything new, but for now, it’s hard to say anything negative about the shoes. 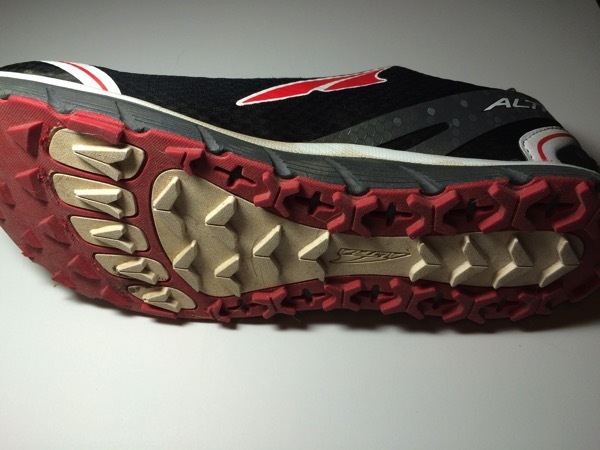 This entry was posted in Product Reviews, Running and tagged altra, product reviews, shoes, trail running by Jason. Bookmark the permalink. Thanks for your review, just bought a pair, feel great, will try them out tomorrow on a steep technical 6 mile trail run. No experience with zero Drop or complete understanding of the theory behind it, but normally run on my toes mostly anyway for speed. 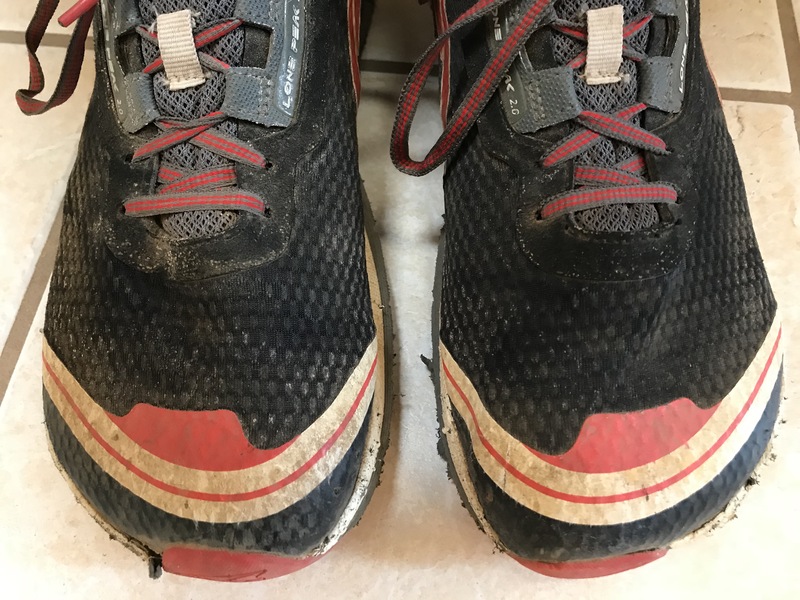 I will check out the wear and tear, as they are costly to be buying a new pair every 3-400 miles, I run way too much to buy shoes that often. Where can I find your further post on this shoe?